So if your child is all ready to be christened by the Holy church and you are about to get nervous as how to show warmth and happiness to your invited guests, don’t panic. Here is something that will help you immensely in serving your well wishers. These cards Templates will execute your service easily. Say thanks to the congregation who witnessed your child take a step further in life. 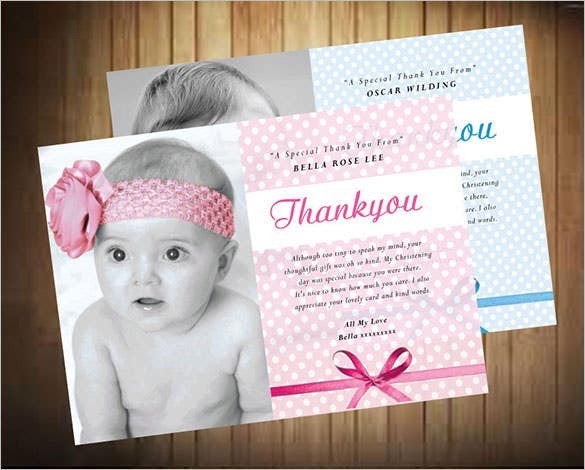 Greet your well-wishers with an emotional and touchy thank you for their presence in your child’s christening in the holy church with this beautiful christening thank you card template carrying a beautiful polka dot background with white typography. Download now. Go for this wonderful thank you christening card template designed to help you send a lovely message to the witnesses of your child’s christening. You can customize this template completely and can also add you own child’s photo on the front page. 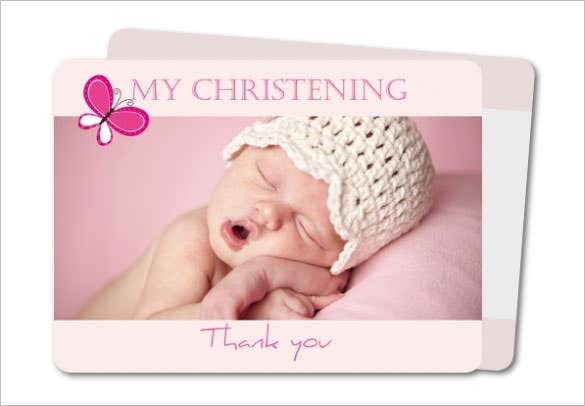 Here is the most beautiful photo christening thank you card especially designed for twins and lets you add photograph of your twins on the front. Superb color combination and typography used. Get customized with your own words and photos. Download now. Download this cool Baptism thank you card template and say a lovely and touchy thanks to all the guests who appeared on your child’s christening in the holy church. This card comes with a white background and beautiful red typography while also having option to add your child’s photo on it. Download this christening photo thank you card template and deliver a heartily thanks to all your guests and witness of your child’s Baptism. Customize this template with your own message and also add your child’s lovely photographs on the front. 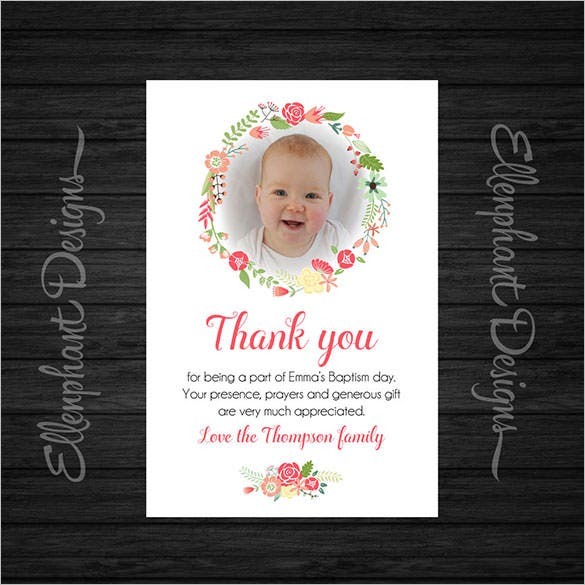 Here is the lovely baby christening thank you card template for you to help send a heart touching thank you message to all your baby christening guests. This is one of the simplest yet elegant card with white background and pink design pattern and typography. 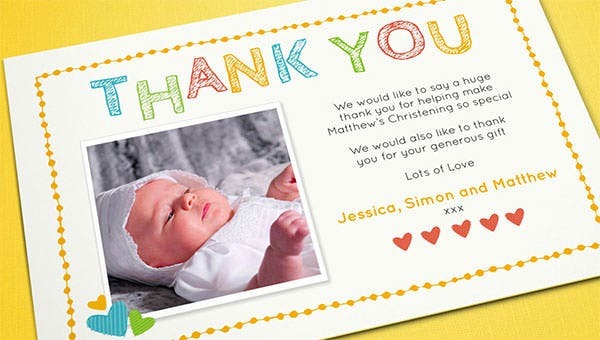 Want to send a lively thank you card to your child’s christening witnesses? 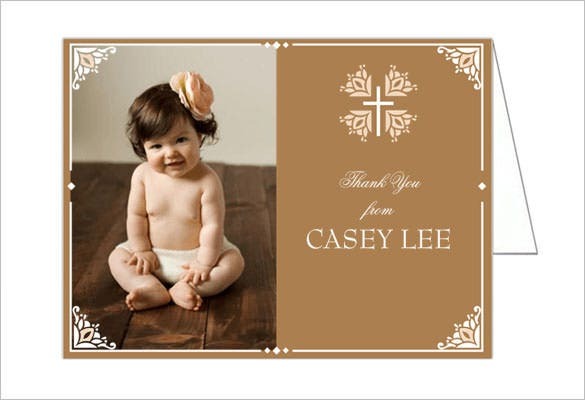 Download this cool christening photo thank you card template and make them feel special and greeted. This template lets you add personalized of your newborn while fully editable text and all. 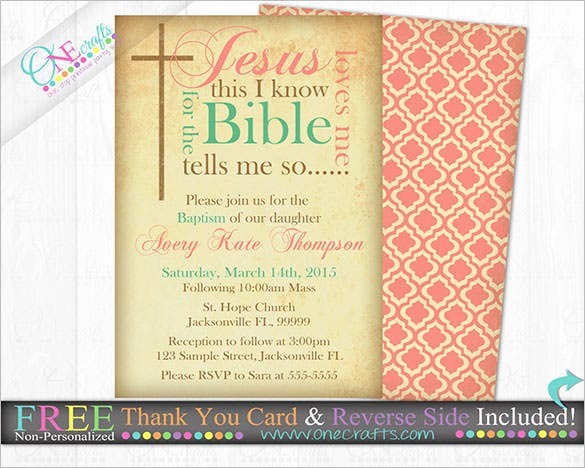 Looking for a thank you card for baptism? 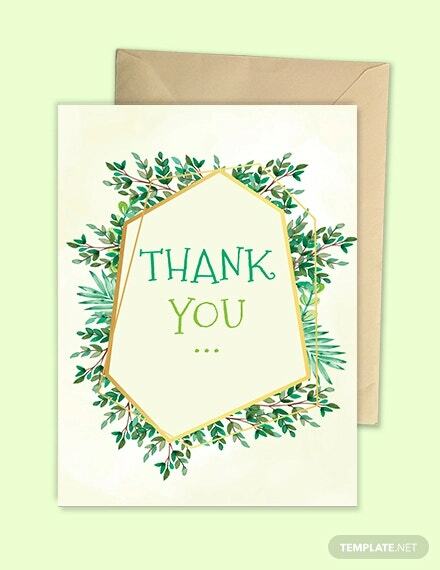 Here is one of the coolest card template options for you designed to make you send thanks to all your guests. This lovely card template can let you add photograph of your baby as the lovely background. 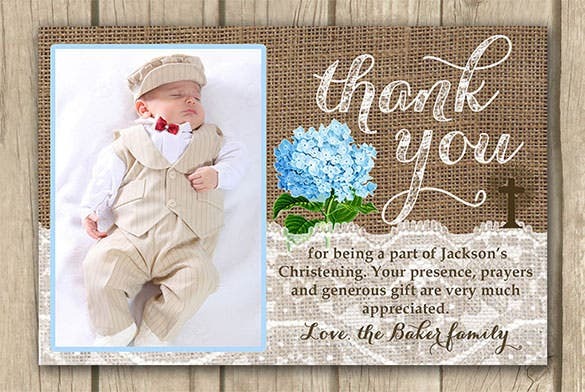 Download this sample christening photo thank you card for baby boy and get it customized to send a lovely thank you message to your guests. Customize with your own words as well as photo of your baby. Available online for download. 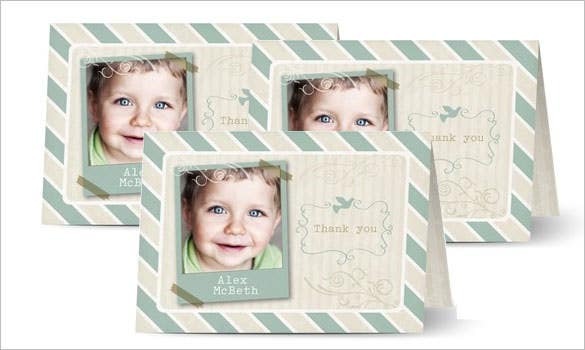 Here is the pack of 10 wonderful photo girl christening thank you cards made to make you express your thanks to your child’s christening day guests. This template comes with a pink background and colorful typography with an option to add your newborn girl photo on to the one side. 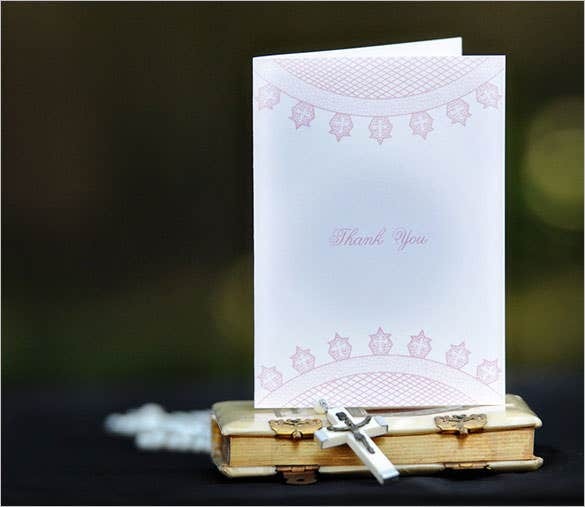 Make your christening day guests feel special by sending a lovely thank you card to them using this thank you card christening template. 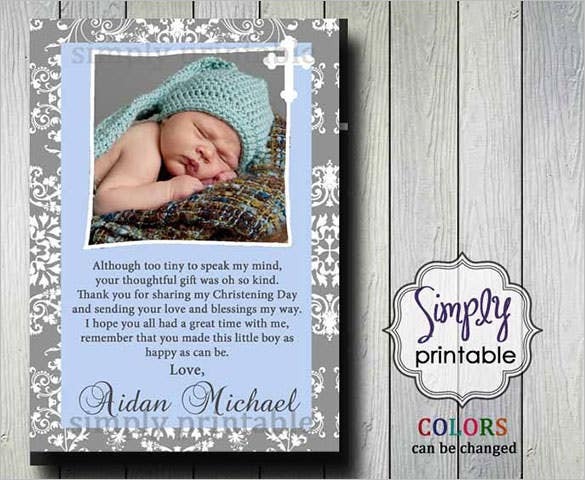 Get it personalized complete by adding your own text and infant’s photo. Available online for download. Grab it today. 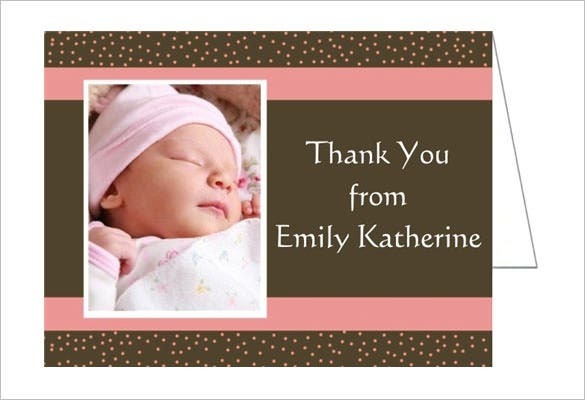 Try this wonderfully created baby thank you card for baptism designed to make you send your heartily thanks to all your guests. This super cute template comes in a cloudy design with option to add photo of your baby along with customizing text. Your guests will really feel special on receiving this card. 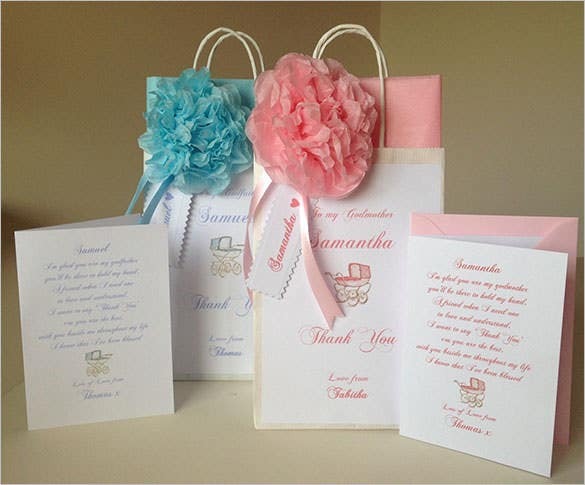 Get this super cute and adorable christening thank you card template downloaded designed in a beautiful girl bag style to deliver a very special thank you message to your guests. Customize with your own text to make it more lovely and touchy. 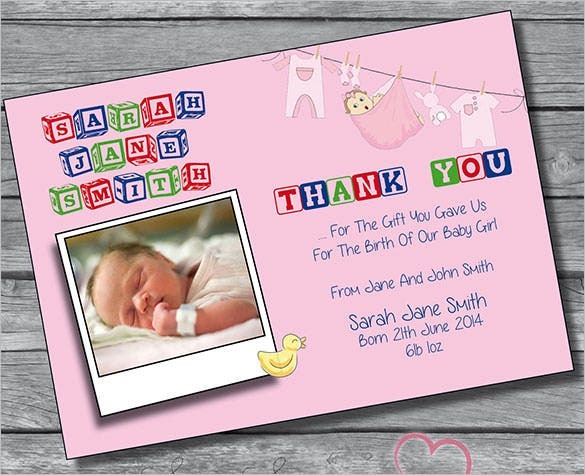 Welcome them with christening thank you card templates for their presence and tokens of love. Seek blessings for the little one who is about to explore the world with tiny benevolent steps. Christening or Baptism is one of the most important event in your and your child’s life with which a baby steps into the new life with a name that would he/she would be known with. It is duty of every parent to greet every guest who witnessed their child’s christening in the holy church with a heartily thanks. 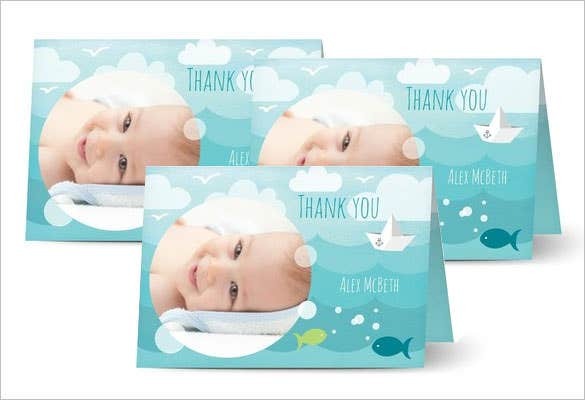 And to help you send thank you card to your guests these christening thank you card templates are designed which make it easier for you to create stunning cards and make them feel special. 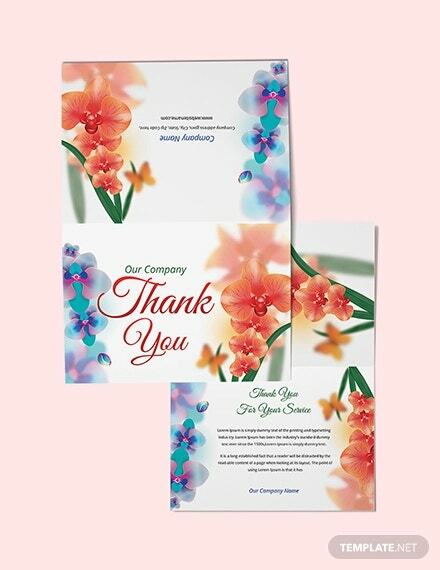 So get any of these templates downloaded and create your very own personalized thank you card for all your guests.